Josh, it’s funny how I can see these cards that I collected as a kid (and still have) and notice things that I never saw before. As many times as I have looked at this card, I never noticed that he doesn’t have a ball in his hand until you mentioned it. RIP Woodie. Fryman’s image and excellent baseball named are ingrained in the memories of Phillies fans of my generation. 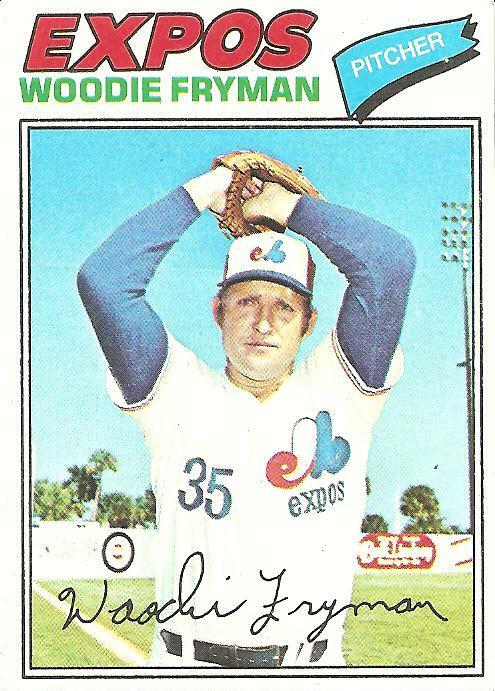 It is a shame how the Expos franchise has been forgotten. Growing up my contrarian little brother decided that the Expos would be his team. A childhood trip to Montreal – the last one we ever took with our soon-to-be-deadbeat dad – bolstered his brave, new pose. We saw the Expos play as Jarry Park, stomping on the aluminium bleachers with the hometown crowd. My brother bought an Expos hat and satin warm-up jacket. That jacket, with all those swirling reds, whites, and blues, was spectacular. Ever since the Expos became the Nationals, as my brother’s birthday approaches, I think about his childhood love for that team and how cool his hat was. I run into Philadelphia’s excellent Mitchell & Ness store, but they NEVER have an Expos hat in stock! I think there’s some site where I can order one online, but that would require more advance planning to meet my brother’s birthday. Thanks for the magical months of August and September in 1972 Woodie. I was checking out his ’72 season this morning: 4-10, 4.36 ERA, for a terrible Phillies team (made infamous for Steve Carlton’s ability win 27 games in spite of them) then 10-3, 2.06 ERA, for the Tigers as they rallied for a division crown. Has anyone gone from so far down to so far up in the span of one year? Playing Strat-o-Matic’s 1977 season on my computer, with player images loaded thanks to someone else’s efforts, that Dan Warthen’s Topps card that year is in the same stance not holding a ball in his glove.